Where did May go? It’s time for another Tuesday Stretch with BugDoc Dave! As promised three weeks ago, I want to begin covering what I consider to be rather unique stretch glass items, cheese and cracker sets. These were made by the major stretch glass producers as well as some of the minor ones. They always consist of a plate with a raised ring in the center and a small, comport-shaped dish that fits inside the ring. Unfortunately, the cracker plates and the cheese dishes often get separated or one item was broken and thrown away. The real problem with this is that many of the cheese dishes will sit inside the ring of another company’s plate. It is common to see married sets that don’t match. It is even more common to see just the plates or cheese dishes being sold separately. The cheese dishes are often sold as “small comports.” As with most common stretch glass items, separating out the different pieces and assigning them to the proper maker is a process of looking at all the details. I had to resort to making line illustrations of many of these sets to illustrate these details. The first sets are from Fenton. The plates of their cheese and cracker sets are easy as they are the only ones that used a snap maire (i.e., doesn’t have a ground base). The ring in the base is also very close to the shoulders of the plate inside. The cheese dish almost always has the top rim distinctly flared out, but the dish is very similar to the ones made by Diamond and Northwood. In the illustration, Notice that there is a very thin, straight-sided ring where the bowl meets the stem and another thinner ring where the stem meets the foot. This set comes in most of the common Fenton stretch glass colors with Florentine Green, Celeste Blue, Topaz, Velva Rose and Persian Pearl being the most common colors. The Wisteria (purple) and Tangerine sets are more desirable and the Aquamarine, while uncommon, rarely commands high prices. Occasionally, the plate will have an acid etch design and the cheese dish may also have gold applied. As far as we know, these were decorated by secondary companies, not Fenton. Fenton also used the Laurel Leaf plunger to add the little leaf design around the edge of the plate and inside the cheese dish. These sets are not common and always command higher prices. 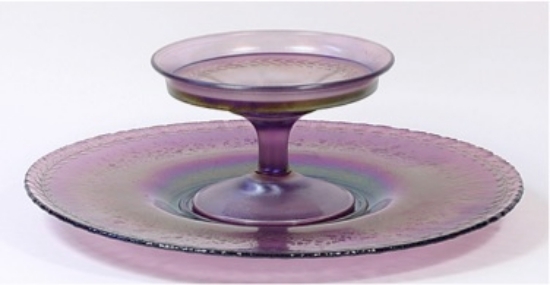 Like many other stretch glass items, Northwood and Fenton made numerous pieces that are nearly identical! However the Northwood cracker plate has a ground base and the ring is set back from the plate edge. While the tops of the cheese dish are similar, the Northwood dishes are never flared out (just a 45-degree angle) and there is no ring where the stem meets the foot. The Northwood sets only come in Topaz, Blue and Russet, though the blue can be a normal Celeste Blue type or the darker “sapphire” blue. I’d love to find one of these in the Jade Blue (the opaque, robin’s egg blue), but none have turned up yet! The Diamond cheese and cracker set is surprisingly difficult to get! The plate is quite large, being over 10 3/4-inches in diameter (Fenton’s is 10 and Northwood’s is just a little under 10-inches). The plate is also distinctive in having a star-pattern in the base. The cheese dish is also larger and has both the top and bottom rings on the stem. However, the top rim is never flared out, but is a straight 45 degree angle. This set is so difficult to get, I only have an image of the plate with a crystal dish inside. I’ve seen the plate in Blue and Crystal, but it should come in the other Diamond colors like Topaz and Green. 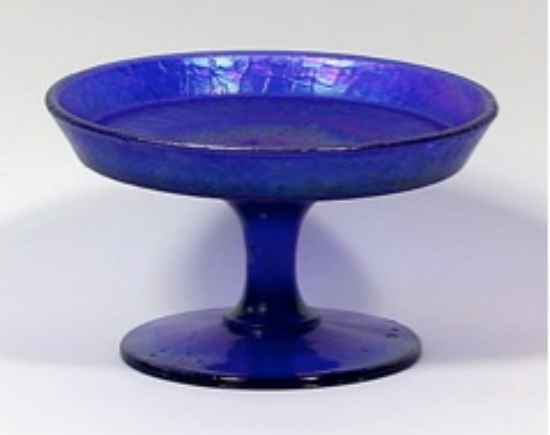 I also know of the cheese dish in the Diamond Blue Crackle (cobalt blue with heavy, crackled iridescence) and believe that someone else has the plate! Hopefully, one of these days, the two pieces will be joined again!